The polls are close…have you cast your ballot? Early voting is winding down and election day is right around the corner – have you cast your vote in this year’s elections? 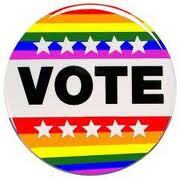 The rights of LGBTQ+ Floridians are on the line this November 4th! While Governor Rick Scott is busy dodging “fans” and standing in the way of marriage equality and as Attorney General Pam Bondi desperately tries to defend her actions following a blasting piece by the New York Times, both Democratic and Republican voters throughout the state are lining up at the polls to make their voices heard! Enough is enough. The time for equality is NOW! Your vote is crucial and every vote counts! If you haven’t already, make sure you vote this November! For polling locations and answers to your voting questions, contact your local Caucus chapter or Supervisor of Elections. « Caucus Meeting – Thursday, Oct. 23 @ 6:30 p.m.